(Bloomberg) -- Once they start, they don’t stop. That’s the word on the street about Toyota Motor Corp.’s share repurchases. While the carmaker doesn’t immediately start buying back shares after it announces a buyback program, once it gets going, it tends to make purchases every day until it reaches its target. And that, says one analyst, is good news for investors in Japan’s largest company. The world’s most valuable automaker said Tuesday that it bought 7.6 billion yen ($69.1 million) of shares in the market on May 31. 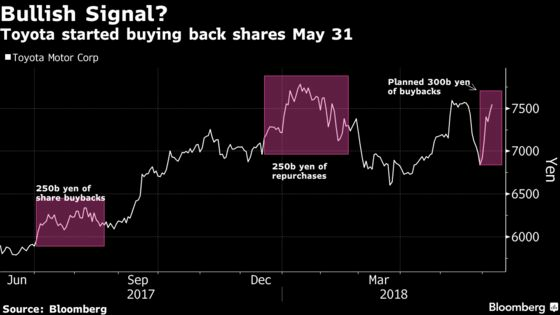 The purchases were the first since Toyota said last month that it plans to buy back as much as 300 billion yen in shares in a four-month period starting May 16. Toyota’s stock surged after the company started repurchasing shares. It’s up 10 percent since May 31, both supporting and trouncing the 3.1 percent advance in the benchmark Topix index. Seiichi Suzuki of Tokai Tokyo Research Institute Co. in Tokyo says Toyota has tended to buy a similar amount of shares every day once it started repurchases in the past. Toyota has carried out four share repurchases in the past two fiscal years. Last year, for example, it said on May 10 that it would buy back as much as 250 billion yen in shares in the period from May 17 to Aug. 31. It started repurchases on July 3 and finished them Aug. 22, spending the maximum amount of 250 billion yen. Toyota shares rose 4.2 percent in the period when it was buying back shares, compared with a 1 percent decline in the Topix. Toyota is more than twice as large as any other Japanese listed company, with a market value of $221.8 billion. It has the largest weighting in the Topix, accounting for 3.6 percent of the 2,082 member gauge.